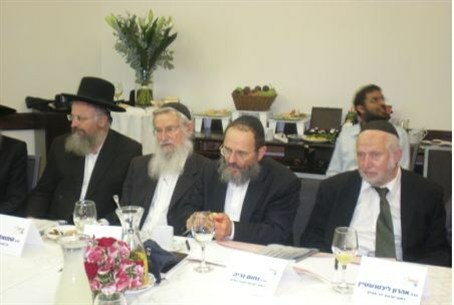 Leading religious-Zionist rabbis gather to create an umbrella group to help the poor. The goal: national group with local focus. It will both serve as an umbrella group for existing religious-Zionist social welfare programs, and will raise and distribute funds on its own. Rabbis present included Rabbi Aharon Bina of Netiv Aryeh yeshiva, Rabbi Zalman Baruch Melamed, head of the Beit El yeshiva and town rabbi, Rabbi Aharon Lichtenstein, head of Har Etzion yeshiva, Rabbi Nachum Neryah of Torah B'Tzion yeshiva, Rabbi Shmuel Eliyahu, chief rabbi of Tzfat, Rabbi Yaakov Shapira, head of the Merkaz Harav yeshiva, and more. The rabbis debated various halachic (Jewish legal) questions pertaining to the establishment of the new organization, its priorities, and its goals in both the short and long term. Also present were representatives of existing religious-Zionist social welfare groups, among them Paamonim, which assists families in getting out of debt, Katef el Katef, and Taasukatif, which helps Israelis expelled from Gush Katif and northern Samaria to find employment. Data revealed at the event showed that the religious-Zionist community in Israel numbers approximately 205,000 households, for a total of approximately one million people. By comparison, the hareidi-religious community is believed to number 105,000 households, and 850,000 individuals. Those present heard that many religious-Zionist families facing a financial crisis are not receiving help from existing organizations. The new Anyei Ircha organization hopes to help those families, as well as others. The group's long-term goal is to have 400 centers across the country in which volunteers will be active in assisting the poor of each city.